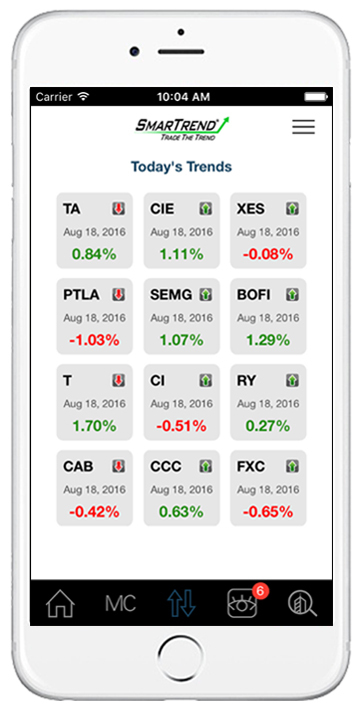 Trade Smarter and Manage Your Investment Better with SmarTrend’s simple and easy to use app. SmarTrend offers Real-time Trend Alerts and Technical Stock Analysis to help you stay on top of the market. A highly accurate, comprehensive commentary written by an expert analyst in the industry, forecasting the trading and investment environment and a summary of key corporate actions, as well as analysis of global markets and commodities. A green arrow indicates an Uptrend, meaning this stock's price movement is positive and most suitable for a long position. A red arrow indicates a Downtrend, meaning this stock's price movement is negative and most suitable for a short position. Watchlist including current trend analysis. give us a call at (703) 797-8135 with your queries and we'd be happy to help.